Fives, a provider of fixed and mobile robotic solutions. Let Fives be your custom integrator for your robotic integration and simulation needs. Our experience will bring efficient and intelligent solutions to your most demanding requirements. 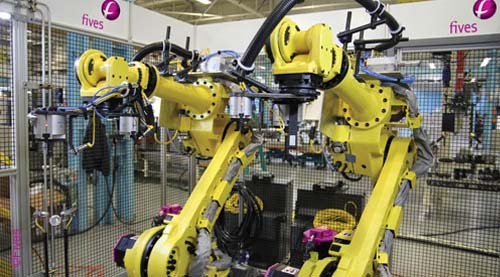 As a leader in integrated robotic vision systems we can provide solutions to your assembly and machine tending needs. Fives will adapt standard and custom designed end of arm tooling for material handling. Let our engineering team design a solution utilizing your favorite robot brand from baseline simulation, mobile study and end of arm tooling requirements. Let Fives manufacturing build and install your customized and validated solution.